It’s a cold winter day. The dogs and I have cabin fever. Hmmm, let’s play a game. I take three paper cups and about nine or ten small dog biscuits into the living room. Each dog will have an opportunity to play a variation on the old “shell game.” I place the cups upside down on the floor in a line. I put a biscuit under one of the cups. The dogs are now watching me with extreme intensity. I move the cups around, making sure I don’t upset the cups. I tell my Greyhound Feather to find the cookie. She walks over to the cups and snuffles at each one. She takes her paw and hits one of the cups. It falls over and underneath is the dog biscuit. She quickly gobbles it down. My other greyhound Tauren’s turn is next. Tauren, being less patient then Feather, runs over to the cups. He sniffs and promptly crushes the cup that has the biscuit under it. He eats the biscuit and carries off the crumpled cup. How can Dogs find a Biscuit under a Cup so easily? The United States Customs employs dogs to search tourists for illegal fruits and vegetables when they return from trips out of the country. Police and law enforcement agencies use dogs to find lost people, detect drugs and contraband, and even search for the presence of accelerants in cases of suspected arson. There have been reports of dogs who can detect the smell of cancer in an unhealed sore. How can dogs do this? It’s their sense of smell. The dog’s nose consists of nares (nostrils) and the nasal cavity, which runs the entire length of the muzzle. The maxillary and frontal sinuses connect with the nasal cavity. The nasal cavity is divided by a mid-line partition into two passages, one for each nostril. At the back, these passages open into the throat behind the soft palate. 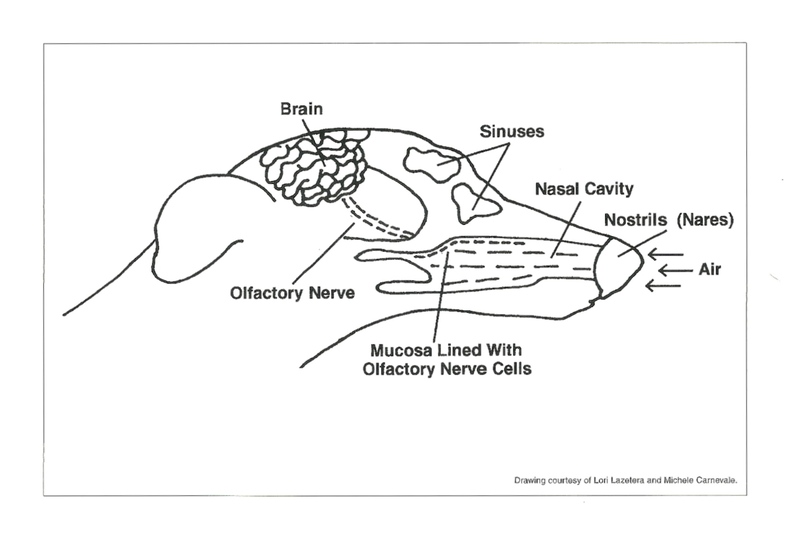 The nasal cavity itself is lined with a mucus membrane that is richly supplied by blood vessels and nerves. The nose is the only area of the body where nerves come in contact with the outside world. There are a great many more nerve endings in the dog’s nose than there are in man. In fact the dog has 220 million olfactory cells versus man’s puny five million. They connect with the highly developed olfactory center in the brain. Together these two, the abundant nerve supply and the well-developed center in the brain, account for a dog’s scenting ability. Graham’s sense of smell is actually unusually good for a greyhound. The stimulus for “taste” is chemical. The same goes for “smell.” In dogs the sense of smell is of paramount importance. Wild dogs use their sense of smell to detect prey species, warn them of danger, and assist them in finding a mate. An easy way of describing this entire process is to take a walk with your dog. You and your hound are walking on a quiet country lane. It is fall and it’s a beautiful day. There are fallen leaves wherever you look. Your hound is walking sedately beside you. His breathing is natural. He takes in air which then flows in a curved course with its highest point occurring at about the middle of the nose and just below the olfactory area. When he exhales the air flows out. He catches a whiff of something by the process of diffusion. Odorous material continually emits particles of molecular size that spread out and are transported by air. 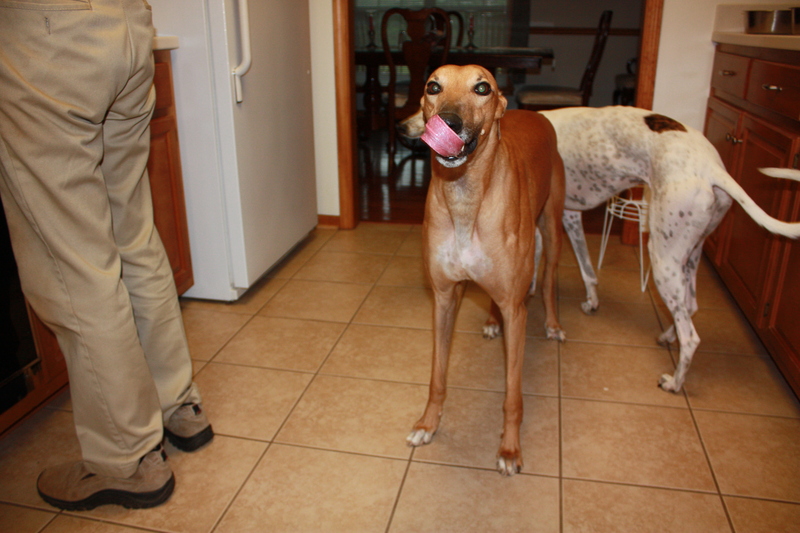 Your hound deliberately inhales sharply. This action causes the air taken in on inhalation to begin to spin creating eddy currents. These eddy currents carry the “smell” to your hound’s olfactory area. The nerve cells in this area send messages to the brain via the olfactory nerve. “FOOD” is what the brain registers. He drops his nose and begins to snuffle around. He plunges his head into a pile of leaves. He comes up with an old chicken bone in his mouth. You remove the bone from his mouth quickly. A dog’s idea of what smells good and what smells good to a human “nose” (a nose is a person in the perfume industry who takes a variety of different scents and combines them together to make a particular fragrance) are completely different matters. Dogs do not respond to odors like flowers because they don’t have any real significance to them. Flowers are not a common prey for the average dog. But with odors such as human sweat (butyric acid) a dog’s responsiveness is one million times better than our own. Tests have been done to prove this fact. Counting the number of smells that a dog can identify would be an almost impossible task. It’s a dog’s sense of smell and the dog’s trainability that allows us to utilize them in such areas such as narcotic detection. 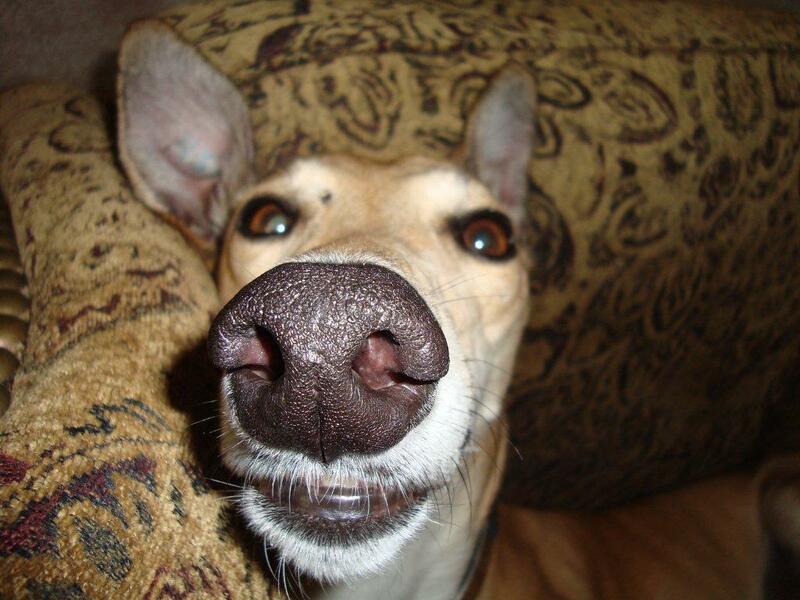 The next time you look at your “sighthound” remember his nose is a pretty impressive piece of work as well.